Is there a better alternative to higgs? Is higgs really the best app in Browsers category? Will higgs work good on macOS 10.13.4? higgs is a minimal, WebKit compatible, native fullscreen client for the ultimate immersive Web experience. higgs' primary focus lies on providing a simple yet powerful client for fullscreen Web applications which cannot or don't utilize HTML5's fullscreen API. higgs needs a review. Be the first to review this app and get the discussion started! higgs needs a rating. Be the first to rate this app and get the discussion started! 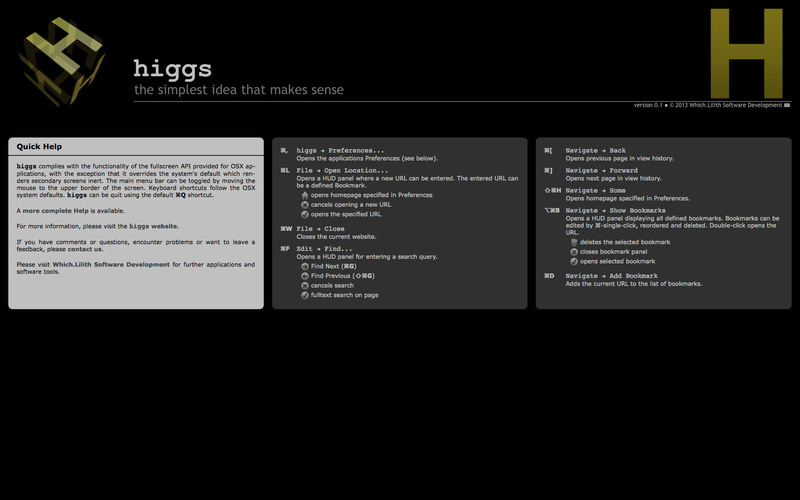 higgs is not a Web browser in the classical sense. Its functionality is reduced to the bare minimum, allowing for only a linear, yet powerful and immersive Web experience. The core feature -- and goal -- lies in simplicity and speed, well suited for the requirements of modern Web-applications and games.